Thank you sun, for coming through the window today. You were missed. Thank you pants, for being so forgiving after 2 nights of peking duck and crème brûlée. Thank you butter, for making my kitchen smell so damn good. Thank you legs, for not forgetting how to ride a bike and making me look sporty. Thank you glasses, for allowing me to spot the bug on my mint. Now I know who's the owner of those black specks of poop on the leaves. Thank you hand sanitizer, for killing (or claiming to kill) 99.9% of the germs. Thank you fruit pickers/fruit deliverers/fruit sellers for making sure my pineapple and papaya were in a good state when I bought them. 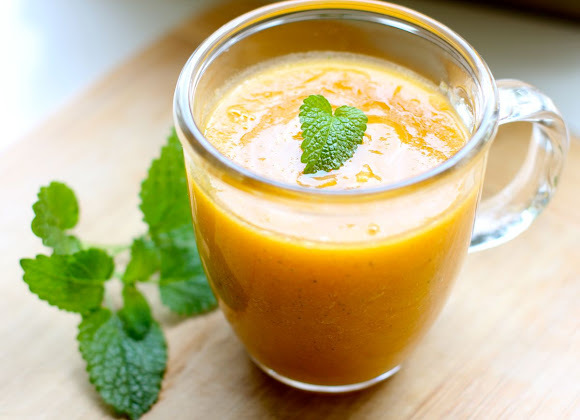 This wonderfully healthy juice has just three ingredients (or four, I like to add chia seeds into everything and trick my family into eating them). Papayas have the strangest seeds. Apparently edible too. Then you just whizz them together in a blender. It's like a bit of sunshine. Plain papaya or pineapple juice by themselves would've been well, just plain and boring. But together, they taste great and is a great way to kick-start any day that needs a bit of sunshine. Like everyday. 1. Press all ingredients through a juice extractor into a measuring cup. 2. Stir to combine before serving. Happy Friday and weekend ahead ya'll! I am hoping to be eating apple crumbles and snugging in bed to watch movies. But I really should go out and be more active like riding my bike and climbing some stairs. never did i thought of mixing the fruits together! i love papaya by itself, it's so awesome :D my grandma's friend grows it in her backyard so we get a lot (only thing is i'm not in Malaysia haha). ha... fun list of thankfuls! And delicious looking beverage! 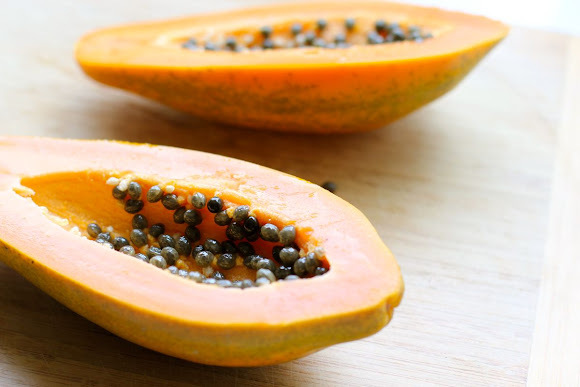 I never knew you could eat papaya seeds! And it does look like sunshine in a glass! 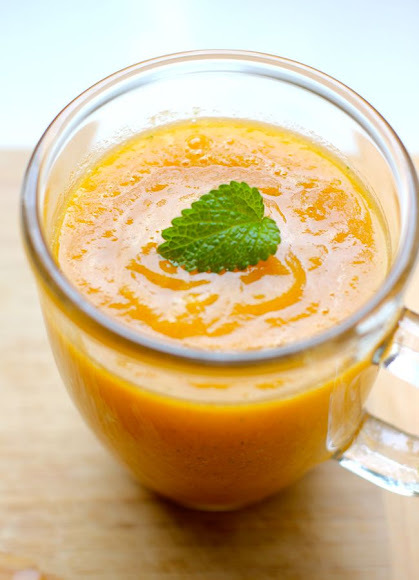 wouldn't it be called pineapple and papaya smoothie since it is pureed together and not juiced? either way it looks delicious. 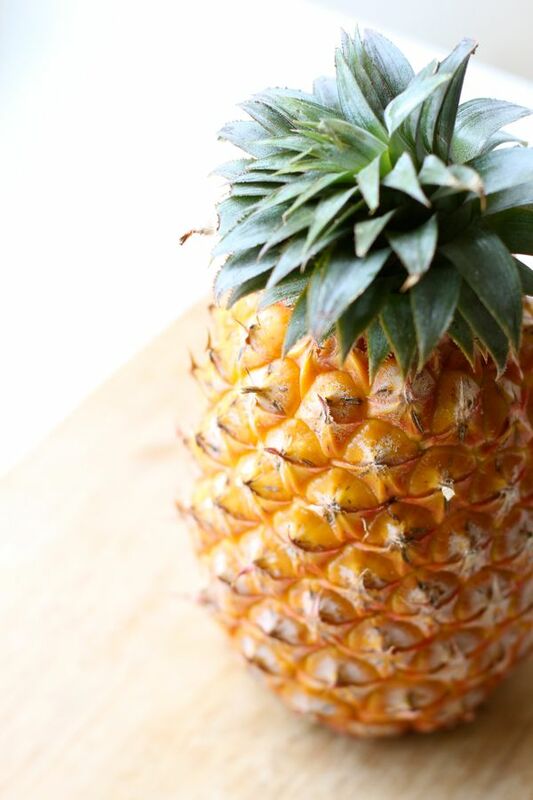 I buy pineapple regularly since i bought a juicer, i'll look for papaya. i personally like juicing better than just blending it all together b/c i don't really like those chunky stringy bits from the pineapple. p.s. nice photo of the worm - he's cute! You CAN judge a book by its cover - this looks refreshing and deliciously sweet! I just discovered chia seeds recently. What else do you like to put them in? I stick to my standby morning oatmeal, but I have friends who drink their water/coffee/tea with chia seeds to help keep them full longer/make their carbs digest slower.... can't say I've hopped on that bandwagon. Happy weekend, Viv! This looks simply scrumptious! Also, perfect timing for this sunshiny day in NYC. That looks so refreshing and tasty and healthy too! I love papaya juice with milk but I have not blend pineapple and papaya together. Thanks for your inspiration, I must try it soon! this weekend it be rest for me since im sick :(! it sounds so healthy yet delicious at the same time which makes me scared haha! Looks deliciously healthy! If you half-freeze it, it would make a fantastic slushee. such a refreshing drink Viv, i love the vibrant color! Very bright and cheerful drink! 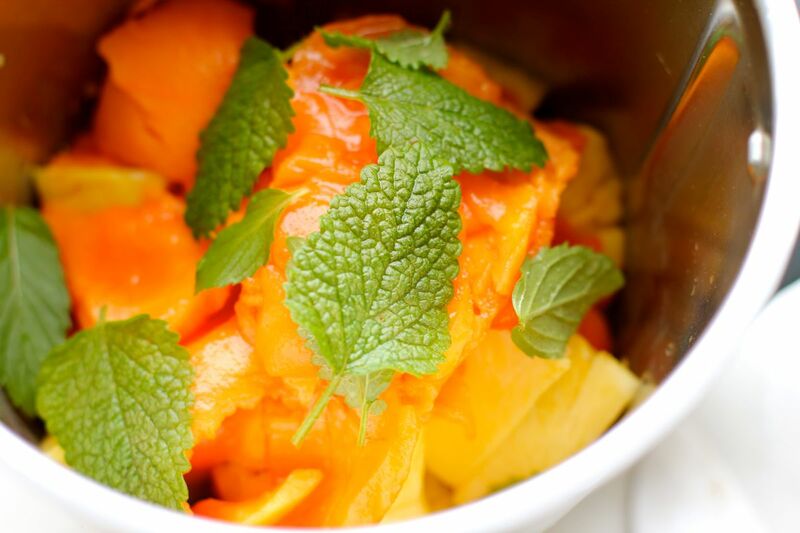 I like the sound of mixing papaya and pineapple together...should be delicious! WOW..this is such a healthy drink. Lovely colour. Beautiful photos. That looks and sounds so good! I feel like I could use a pitcher or two to re-energize myself. Taking a shower just doesn't cut it anymore. This weekend I'll be working, finishing up some assignments for class, and working on my internship. I'll be lucky to get any rest at all. Beautiful! I could use some of that sunshine now. Papaya and pineapple are a great combo. Beautiful drink! My fiancee bakes a lot using the Martha Steward recipes. Maybe she should try out Martha's other recipes as well. We just bought a ton of fruits to make healthy shakes this week. 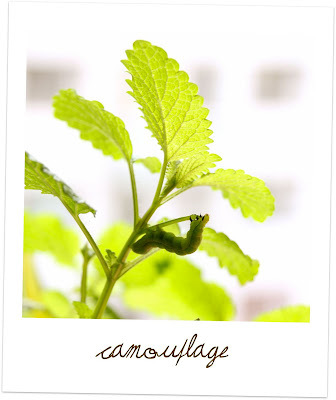 Do you grow your mint? We grow a few types of herbs every summer. Home grown herbs are the best! I grow our own papaya and they are the best. I have mint in my garden. 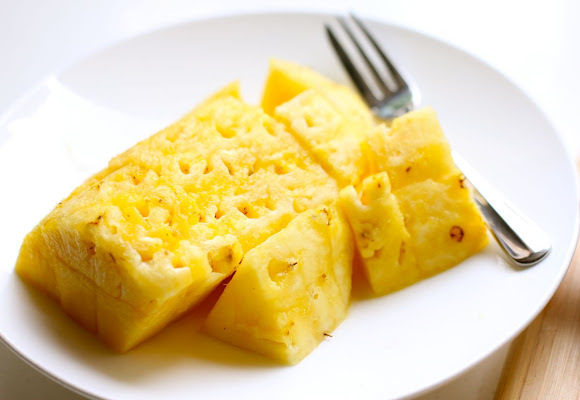 Now I just gotto go buy some pineapple and I can make this. YUMMM! Amazing site with AMAZING photos! so glad you visited me the other day so I could find your delicious blog! Will be a regular from now on that is for sure! Might even do your agar recipe for my recipe challenge this week. You should so do the recipe challenge with us. You can see details on my blog sidebar button! Have a great day! I follow you now! 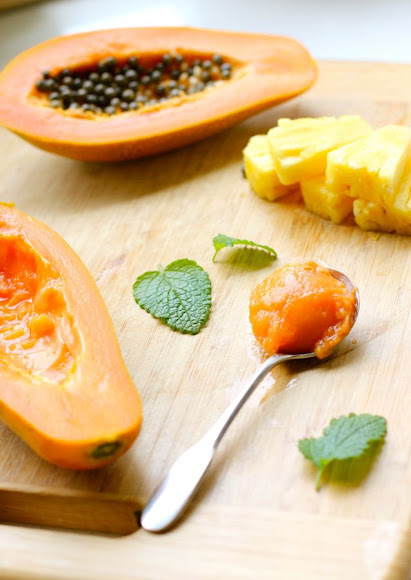 Papaya and pineapple can be raised easily in your backyard. They will also give you health benefits. I like these fruits very much. Wow this is such a healthy, refreshing drink. I wish I had a big tall cool glass right now! definitely awesome for summer... i know wat i'll be making! You make everything all the more appetizing with your photos. Fruit never looked so scrumptious! Sunshine in a glass indeed. This sounds so refreshing! We used to get the best papaya in Brazil. I haven't tried one around here in a while, but I have noticed stores are carrying more varieties. This juice may convince me to give one a try! I will definitely keep this drink in mind to detox after this long weekend! Thanks for the tip! I have not tried mixing papaya and pineapple before. It's always papaya and milk or papaya and lime or lemon. I must say anything with pineapple is always refreshing to me. Looks like a great way to start the day! I really need to start making juices out of fruits, cause it's the only way I get my fruit intake, unless of course they are in desserts! I love pineapple! I want to tray it! Thanks for the post. People who are really concerned about their health may take help from the noni fruit juice so as to keep themselves help. Noni fruit juice is very healthy and it is natural anti-oxidant and anti inflammatory. Women may take help from the women's choice noni juice in their regular diet so as to maintain good health.